Does this sound complex to you? Well, it is not! It is actually programming for engineers. Instead of code, you use simple, intuitive blocks. In our case, we use MATLAB/Simulink®. So: the old fashioned way of writing complex code becomes connecting blocks with lines, which can be understood quickly, by any engineer. The connected blocks are the model. Specification: The model, consisting of the blocks is actually a specification of the algorithm. You can easily discuss about the algorithm with fellow engineers of your customer. They will understand the blocks quickly. Documentation: The blocks are very intuitive. You can add markup with text and images, so your algorithm will become self-documenting. Implementation: The greatest part! Using HANcoder together with MATLAB/Simulink, your blocks can be automatically transformed (‘autocoded’) into a running program on your microcontroller. So, the blocks are also the final implementation. Besides this simple step of programming using blocks, there’s more to Model Based Development. Several techniques exist to take more advantage of using MBD. On the top left, simulation is used for the first design and development of your algorithm. In the simulation, you connect your control algorithm to your plant model. This provides deeper understanding of system and controller behaviour and allows you to develop and refine your control strategies in a very early stage. Due to the gained knowledge in detailed system behaviour, this step can also be used to refine requirements. As a last step, in the top right of the figure, you optimise your function. If your code is running in the control system, you want to be able to visualise measured and calculated signals of the system. You may also want to tune the settings (called parameters) in your control algorithm to optimise its performance. For this, you can make use of HANtune. 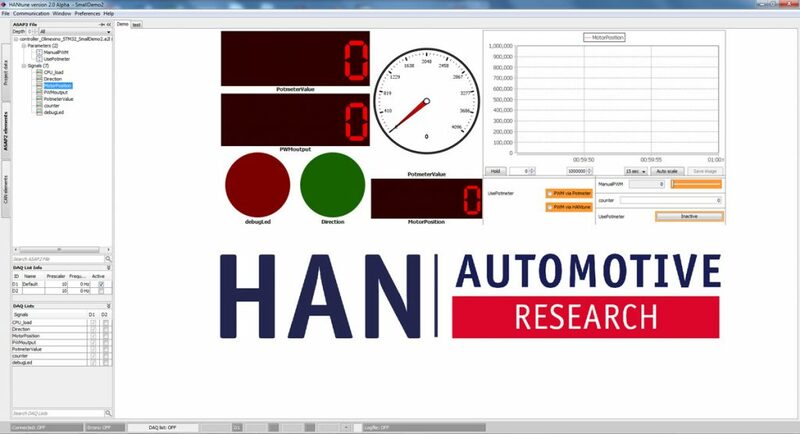 With HANtune you can create your own dashboard layouts to visualise and tune your control system in real-time. HANtune connects to the control system via various protocols.